Soft Cover, 352 pages, 6x9. Explore the evolution of one of craft beer's most popular styles, India pale ale. Equipped with brewing tips from some of the country's best brewers, IPA covers techniques from water treatment to hopping procedures. Included are 48 recipes ranging from historical brews to recipes for the most popular contemporary IPAs made by craft brewers such as Pizza Port, Dogfish Head, Stone, Firestone Walker, Russian River, and Deschutes. About the author:�Stone Brewing Co. Brewmaster Mitch Steele has brewed at some of the largest and smallest breweries in the world since graduating from UC Davis with a fermentation science degree. Landing at Stone Brewing Co. in 2006, Steele has overseen the brewing and packaging operations as the brewery has grown from a 48,000-barrel operation to 148,000 barrels in 2011. Steele is a long-time IPA fan and an avid homebrewer. 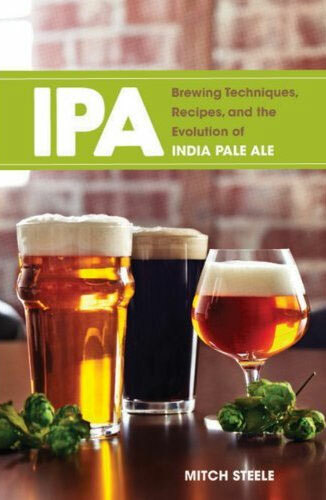 REVIEW: [Mitch Steele]�has taken what he has learned and neatly woven it into an engaging and eye-opening history of IPA blended with immensely technical brewing information. Mitch not only debunks the classic story of what the first IPAs really were and how they were made, but also chronicles the tragic account of ale's rise and fall over the last three centuries. Then he goes on to include a serious volume of recipes and techniques from classic Old-World IPAs to modern craft-style double IPAs. This book should sit on every brewer's bookshelf.